In 2010, best-selling author and high-profile atheist Christopher Hitchens learned that he had cancer, which ultimately killed him just a year and a half later. Mortality is his short eye-opening account of his time in what he called "the land of malady." The work begins with his first thoughts after diagnosis and carries through to fragments of writing he never finished, before ending with an afterward written by his wife. He touched on many subjects: the duality of coming to peace with death while still trying to live, public reactions to his illness, the etiquette of talking to sick people, his fear of losing his voice and his ability to write, his thoughts about Randy Pausch's The Last Lecture, and his changing feelings about the sentiment "whatever doesn't kill me makes me stronger." He covered a lot in about 100 pages, and it goes very quickly. I haven't read any other Hitchens, save for an article here or there, so this was maybe not the Hitchens book to start with. I picked it because it's short and it's about death and that intrigues me. 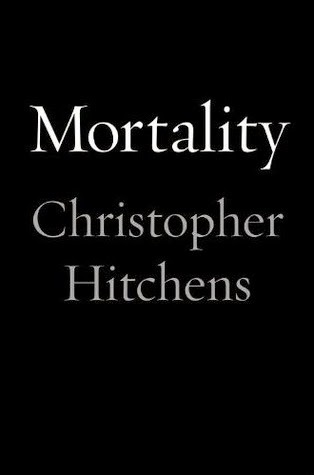 It does contain a lot of insight, but I don't really know Hitchens so it's a bit strange to start with his final thoughts. Perhaps I should have read God Is Not Great, and a number of times I've thought of picking it up, but I kind of feel like he'd be preaching to the choir. Still, Mortality gave me a taste of his style and left me with some food for thought. If it intrigues you at all, give it a try - it's a meager investment in time and effort. Pair it with Being Mortal by Atul Gawande. They would complement each other in their different but common perspectives on how people experience the end of life.